“mankind never sets itself a problem it can not solve” enunciated a mighty thinker. Well,the industrial world assuredly has its conundrums. One burning issue is the destruction wrought by decades of industrial agriculture. As Dr. Mercola tells us, the challenge facing most farmers today is that conventional agriculture has really decimated the topsoil with tilling and the use of synthetic fertilizers, both of which disrupt and destroy microbial life. Maria-Helena Semedo of the Food and Agriculture Organization of the United Nations has warned that at the current rate of topsoil degradation, all the world’s topsoil will be gone in less than 60 years. A dire situation, yet the human spirit has risen to the occasion and has come forth with some wonderful remedies by way of building a healthy soil ecosystem. In this video, Dr.Mercola interviews Gabe Brown, a pioneer in soil regeneration. Its elements include not disturbing the soil microbiome, protecting the soil surface with cover crops, diversification, maintaining living roots in the ground as long as possible and integrating livestock and insects. Wonderfully, these are applicable not only to a large farm but even to a backyard plot or community garden. Dr.Mercola adds: Even college students living in a dormitory and those who rent can grow sunflower seed sprouts or microgreens, or participate in a community garden if there’s one nearby. Growing your own food may seem daunting at first, but it’s actually a really practical approach that creates a great deal of security. If you grow a large portion of the fresh food you eat, that’s hard-earned dollars you won’t have to spend at the grocery store. And you’ll have better quality food. Is there any word but CUTE to describe little baby pumpkins, no more than 3″ wide? When I saw these in the field I asked our farmer if they were edible and if we could harvest them at that size. She said she’d never tried and we cut one open right there to see if the flesh was ripe, and it was! I loved the shape of these babies and immediately thought stuffing them was the way to go to preserve the beauty of their shape. I was inspired to make this vegan recipe by a Thai kabocha squash soup I used to love-it had a creamy coconut base and greens. Kabocha squash is an orange fleshed Japanese pumpkin. 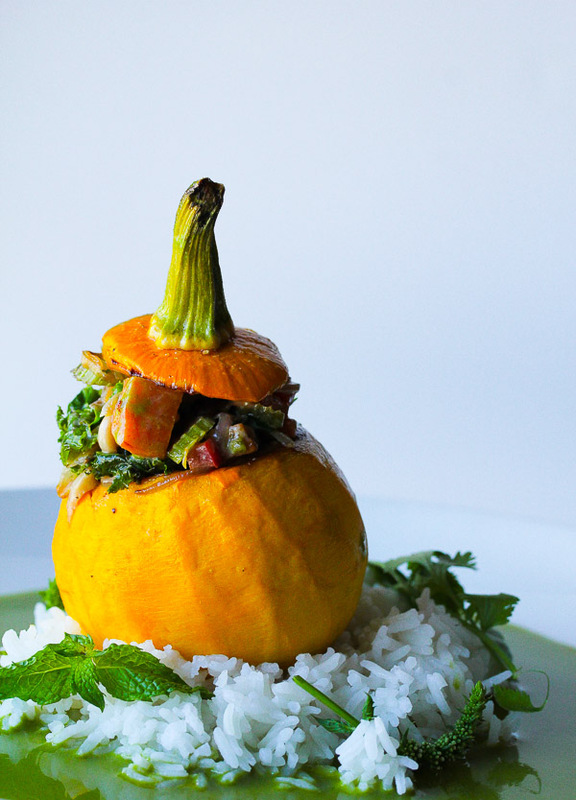 So we decided to serve this pumpkin dish with a green curry sauce and white jasmine rice. The Makela family arrived in California in 1778. Decades later, in 1855, their Great, Great Grandfather, Jules Goux, planted the first commercial olive grove in the wondrous fertile land. Today, the tradition continues with the tenth generation who are still growing organic olives on their family’s land. These black olives are a tasty addition to salads. Cured in salt and then sundried and rolled in extra virgin olive oil and spices. Contains sea salt, organic spices, olive oil. These olives contain pits. Imagine Ziziphus jujuba on your festive table! Grown for you by Judith Redmond with Full Belly Farms, an outstanding family farmer here in California. Coconut Oil – Alive & Organic – Back! Living Tree Raw Organic Coconut Oil is made from fresh coconuts. The flesh is chopped and placed in an expeller press. The temperature of the coconut flesh and the emulsion does not exceed room temperature. The coconut milk emulsion has the water “spun” out of the oil using a centrifuge. This is the only method of extraction that requires no heat at all. This virgin coconut oil is creamy and the smooth. It has a very mild taste. Melts in your mouth like a delicious candy. Very low moisture contents and a very long shelf life. Boreal Dulse Flake Energizing Mix – Back! We suggest sprinkling it on everything you eat. The dulse flakes are harvested by Grettir Hreinsson, a live food afficionado. Gathered in a remote part of Iceland. Dehydrated below 83 degrees, Fahrenheit. We’ve added California almonds, Oregon pumpkin seeds as well as sunflower and sesame seeds. Peaches (California) – Sundried & Organic – Back! Organic and Sundried! Moist and chewy. Hemp hearts are a nutrient dense source of protein, essential fats, and antioxidants. We suggest you add to soup, salad or vegetable dishes. Sprinkle onto cereal, oatmeal or yogurt. Add to desserts. Add to smoothies. Sprinkle onto almond or cashew butter spread on a slice of apple or pear. Sprinkle in sandwiches or wraps. These pinenuts nuts are wildcrafted from trees in a pristine wilderness, the Siberian taiga. This is the most extensive virgin forest in the world. We invite you to experience the taste of the primordial! Siberian pine nuts are quite different from the pine nuts you find in stores. The latter are imported from China and are a species of Korean pine nut, Pinus Koraiensus. Siberian pine nuts are a different species, Pinus Sibirica. They are the fruits of a majestic and beautiful tree. Available in 16oz. or one gallon, 128oz., glass bottles at a considerable saving. Living Tree Raw Organic Coconut Oil is made from fresh coconuts. The flesh is chopped and placed in an expeller press. The temperature of the coconut flesh and the emulsion does not exceed room temperature. The coconut milk emulsion has the water “spun” out of the oil using a centrifuge. A delightful pumpkin seed spread made from American pumpkin seeds. Nourishing and energizing. A balanced source of good protein. (Mercola) Exposure to pesticides, herbicides and insecticides has dramatically increased since the introduction of genetically engineered (GE) crops. Urine output of glyphosate, the active ingredient in the herbicide Roundup, shot up by more than 1,200 percent between 1993 and 2016.1 Unfortunately, glyphosate is not the only chemical of concern. Chlorpyrifos (sold under the trade name Lorsban) — an organophosphate insecticide known to disrupt brain development and cause brain damage, neurological abnormalities, reduced IQ and aggressiveness in children — is another. In adults, the chemical has been linked to Parkinson’s disease and lung cancer. Chlorpyrifos has been in use since 1965, and is commonly used on staple crops such as wheat and corn, as well as fruits and vegetables, including nonorganic citrus, apples, cherries, strawberries, broccoli, cauliflower and dozens of others. Since the chemical has a half-life of several months and can remain on sprayed foods for up to several weeks, nonorganic foods are a major source of exposure. Importantly, nonorganic, non-grass fed meats are likely to be loaded with this chemical, since conventional feed consists primarily of genetically and/or conventionally-raised grains such as corn. This is yet another reason to make sure you feed your family grass fed meats and animal products, especially your young children. Chlorpyrifos is also a commonly found water contaminant, and has even been found in indoor air. (Mercola) Apples genetically engineered to resist browning when sliced or bruised are on their way to about 400 grocery stores in the U.S. Midwest. Developed by Okanagan Specialty Fruits, the apples are engineered to suppress the production of the enzyme — polyphenol oxidase (PPO) — that causes browning. The first two varieties of the so-named Arctic Apple — Arctic Golden and Arctic Granny — were deregulated by the U.S. Department of Agriculture in 2015. A third variety, Arctic Fuji, joined the mix in 2016. Their arrival in stores is noteworthy for a number of reasons, the first being that this is the first Genetically modified organism (GMO) designed to have a perceived benefit for consumers. While people have been consuming genetically engineered (GE) foods for some time — often without knowing, since labels aren’t required — the GE products were designed to appeal to farmers. For instance, Monsanto recently released Roundup Ready Xtend cotton and soybean seeds, designed to tolerate both Roundup and dicamba herbicides. Consumers wouldn’t go seeking out this type of soybean, but rather consume it by default, because it’s planted by farmers. This is changing with the release of GE Arctic Apples, which could prompt people to seek out the non-browning apples by name.